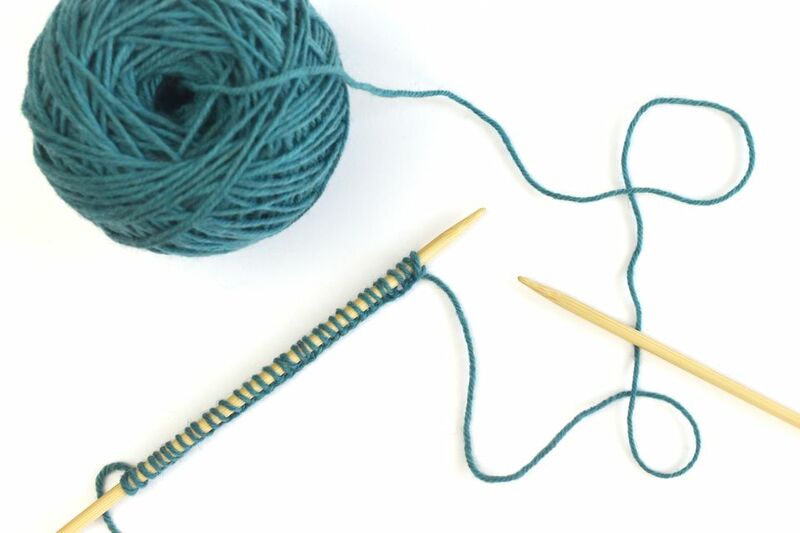 There are many different methods for casting-on in knitting, but the knit cast-on is perfect for beginners because you learn how to form knit stitches as you add the stitches to the needle. This makes the learning process go a bit faster. Casting on is the first row of loops on a knitting needle. This knit cast-on is not just useful for beginners; it is also a great choice for several types of knitting projects. You can use it for casting on a lot of stitches without the risk of too short of a long tail. It's great if you need to add stitches in the middle of a row. Sometimes you are making something that requires a little stretch in the first row, for example, hats and sweaters. The knit cast-on is perfect for that. The next step is to learn how to do the knit cast-on technique. Like most cast-on techniques, the knit cast-on begins with a slip knot. Hold the yarn so that the tail of the yarn ball is hanging in front of your hand. Wrap the yarn loosely behind the first two fingers of your left hand. The yarn should loop all the way around your fingers clockwise. Take the part of the yarn that is attached to the ball and slip it back under the loop behind your fingers. Then slide this off your fingers, pull to tighten slightly, and slip it over the needle. Hold the needle with the slip knot in your left hand and the empty needle in your right hand (if you are right-handed). You can flip it if you are left-handed. To begin the cast-on, slide the right-hand needle into the loop on the left-hand needle, from front to back. This is known as "opening the loop." This is exactly how you start making a knit stitch. Loop the working yarn (the yarn coming from the ball) over the point of the right-hand needle, going counter-clockwise. Be careful not to loop the yarn over both needles. Hold the yarn loosely in your right hand. This is known as English knitting, right-hand knitting or "throwing," which is different from continental knitting, in which you hold the yarn in the left hand. You can, of course, do the same thing continental style if that is the method you want to learn. Next, you will bring the looped yarn through to the front. Keep holding onto the yarn with your right hand so it does not get away from you. Slowly slide the right-hand needle down so the loop gets close to the tip of the needle without sliding off. In the same movement, bring the right-hand needle out from behind the left-hand needle. When the right-hand needle barely comes out from behind the left-hand needle, push the needle in front of the left needle. The goal of this step is to keep the loop you just made on the right-hand needle while bringing it to the front of the work. The slip knot stays on the left-hand needle. Although this can seem a bit awkward at first, with practice, it becomes second nature and you will not even have to think about it. Add the new stitch you just formed to the needle. Slide the loop that is on the right-hand needle onto the left-hand needle, next to the slip knot loop. Try to pay attention to the direction of the loop as you add it to the needle, keeping it consistent throughout the cast on. Turning the stitches produces different results. You now have two stitches on the left-hand needle, and you can continue on. You will want to repeat these steps until you have the required number of stitches on your needle. Watch your tension. As you cast on stitches, try not to pull too tightly as you wrap, or your stitches will be hard to work on the next row. Your loops should be tight enough to stay on the needle, but loose enough to slide the second needle through with ease. This is tightness is called the tension. With more experience, you will learn what the right amount of tension feels like. Now that you have all the knit stitches cast on, you can continue with the rest of your project. Once you feel comfortable with this method, try other cast-on stitches like the long-tail cast-on, the cable cast-on, the wrap cast-on, and the frilled cast-on, to name a few. How Do You Turn a Heel While Knitting Socks?